I guess those youngsters just don’t have quite the intimate history with the plant like I do. And I do mean “intimate” as I’ve had it everywhere and I’ll leave it at that. A few shots were in order as a kid and more than a few orasone or prednisone prescriptions have been issued in some of the classic battles over the years. Like today’s lyric, a collection of pink spots on the anatomy was not uncommon either via calamine or caladryl. Even had to resort to the wash thing a time or two in an effort to stop the itchy madness. You’d think a guy with such a history would learn, but from time to time I still find myself in a risk versus reward quandary. It goes a little something like this. 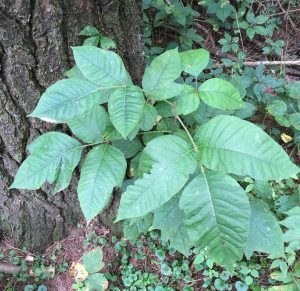 Do I walk through that batch of poison ivy to get to that spot that looks like it could really be the ticket to some good bass? Do you remember putting up the tent in the dark at Green Oaks only to find out when morning came that it was in an ivy patch? Good times for everyone but TJ. Yep, for some reason a few of those camping trips were a little reckless. Actually probably a couple dozen reasons.